When will you be accepting new cable orders? We open for new cable orders about every two weeks. You can view our schedule to see when the next open window will be and learn a little bit more about our current ordering procedure. Please keep in mind that other products like DIY kits, DIY parts, deskmats, and other items are always available for purchase. Why is “ADD TO WISHLIST” my only purchasing option? We regularly disable purchasing for custom cable products when we are working through a backlog of cable orders. Doing this helps us prevent production times from stretching out too long, and ensures we can deliver cables relatively quickly. When purchasing is disabled, “ADD TO WISHLIST” will be the only option you see on the product page. If you have a cable emergency or are having trouble catching us during “open” times, feel free to contact us anytime and we’ll do our best to help you out. What connectors do I need? That depends on what you are plugging your cable into. Below are some general rules of thumb, and images of some of the most common types of connectors we offer. 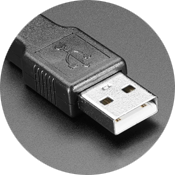 USB Type-A connectors typically plug into the back or front panels of your computer (or outlet adapter). 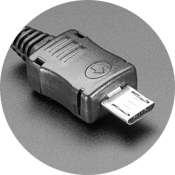 Mini-USB is a popular connector type that plugs into most mechanical keyboards, digital cameras, external hard drives, and USB hubs. Micro-USB is a popular connector type that plugs into small devices like cellphones, tablets, and other portable devices. 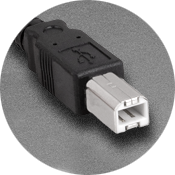 USB Type-B connectors are square shaped, and are found on printers, scanners, and other peripheral devices. 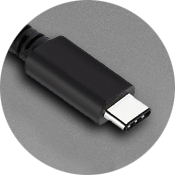 USB Type-C connectors are reversible connectors that are popular on many newer smart phones and computers. How long can a USB cable be? We recommend keeping the total length of your cable under 16 feet. Anything longer than that, and the cable falls out of USB spec and risks losing its transmission power, which could cause it to under-perform or fail. If you are using your USB cable to connect a keyboard that draws a larger amount of power (one with a lot of LEDs or RGB functionaity for example), the maximum operative length may be significantly shorter than 16 feet. In most cases, 10 feet or less is preferable. Based on testing we've done with our cables, there are some high-powered keyboards that require even shorter cables—like HHKBs (8 feet) and Input Club’s K-Type or Massdrop’s CTRL (7 feet). What do you make the cables out of? The cable we use is a USB 2.0 spec 28AWG, four-core dual-shielded cable that has tinned copper conductors and a PVC jacket. The cord we use is USA-made Type III nylon (or nylon/polyester) paracord. The double-sleeving materials we offer are Techflex Flexo PET and MDPC-X sleeving. Double-sleeving is a second layer of sleeving that covers the cord and adds an extra layer of durability, rigidity, and style. What is the difference between Techflex and MDPC-X? Both Techflex and MDPC-X are made out of the same type of material (woven plastic threads). The main difference is in the density of the weave. Techflex is a looser weave and will reveal more of the cord color underneath. 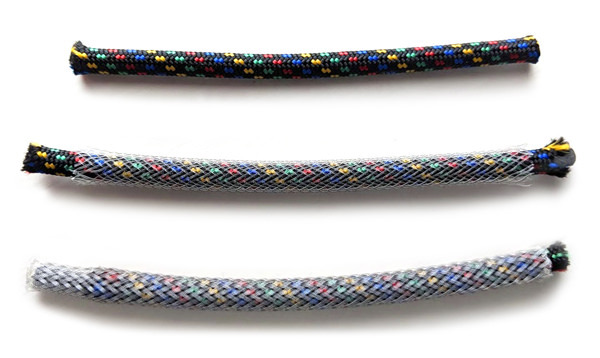 MDPC-X is a tighter weave, and will cover 100% (more or less) of the cord underneath. Coils are a fun way to add a little extra style to your cable. While our coils have good memory and are made with care, they are primarily an aesthetic feature. Prolonged stretching or aggressive handling may weaken the coils and loosen their uniform appearance over time. Unless specified otherwise, our coiled cables will have about 4" of straight cable on the device end (typically a Mini-USB, Micro-USB, or USB-C connector), then the coiled section, and then the remainder of the cable length on the host (USB-A) end. Ordering note: When ordering coils, the length of coils you select will be built in to the overall length of the cable. For example, if you order a 4-foot cable with 6 inches of coils, the cable will not be 4’6” in overall length. It will be 4 feet long and include 6 inches of coils. Will my cable work when it arrives? Of course, yes! We double-check every cable before we ship it to make sure it is working properly. If for any reason you receive a cable that does not work out of the box, let us know right away and we will send you one that does. You bet! We’ll ship anywhere. When placing an order, you should be presented with the appropriate shipping options for your country. If you’d like to get a custom shipping quote or have shipping questions, contact us and we’ll get you the information you need. We offer returns to any Zap customer who isn’t completely satisfied with their cable. You ordered from us, and that means a lot. If you’re not totally satisfied with your cable, please let us know. We’ll do everything we can to address the problem and get you a cable you are totally satisfied with. Unfortunately, we do not accept returns on DIY Kits. If you do want to return your item(s), we’ll be happy to help you out. Use the form on our Contact page or shoot an email to hello@zapcables.com with your order number and the nature of your dissatisfaction, and we will address your request posthaste!